Secondary antibody deficiency has been associated with risk of invasive fungal infections in solid organ transplantation. Single center, multi-center and meta-analysis studies have tested this association. Therapy of these infectious complications in the presence of a secondary antibody deficiency after transplantation remain a challenge for transplant teams. Currently, there are no guidelines for the management of this combined clinical scenario. We report the case of a patient with severe secondary immunodeficiency before and after heart transplantation who developed several infectious complications including, cardiac invasive aspergillosis, and had a long-term survival after combination therapy of anti-microbial drugs and prolonged intravenous immunoglobulin replacement therapy. Secondary antibody deficiency has been associated with risk of invasive fungal infections in solid organ transplantation. Single center and multi-center studies performed in heart and lung recipients have tested this association [1,2,3]. A meta-analysis has demonstrated that severe IgG hypogammaglobulinemia (defined as IgG < 400 mg/dl) during the first year after solid organ transplantation is a risk factor for severe infections including invasive fungal infections and cytomegalovirus disease . Therapy for these infectious complications in the presence of a secondary antibody deficiency after transplantation remain a challenge for transplant teams. Currently, there are no guidelines for the management of this combined clinical scenario. We report the case of a patient with severe secondary immunodeficiency before and after heart transplantation who developed several infectious complications including, cardiac invasive aspergillosis and had a long-term survival after combination therapy of anti-microbial drugs and prolonged intravenous immunoglobulin (IVIG) replacement therapy. A 52-year old white woman received a heart transplant. Pre-transplant evaluation disclosed NYHA V status with LVEF of 15%. There were no infectious episodes before transplantation. Due to pre-operative heart failure complications a biventricular assist device was necessary. Surgical data included ischemic time 231 minutes and extracorporeal circulation time 318 minutes. Induction with anti-CD25 monoclonal antibodies was used (2 doses of 75 mg at day 1 and 14 after transplantation). Maintenance immunosuppressive therapy included corticosteroids, mycophenolate, and tacrolimus. Anti-microbial prophylaxis included peritransplant IV cephalosporin, IV ganciclovir for 3 months and trimethoprim sulfamethoxazole. The patient was not previously vaccinated with pneumococcal vaccine. Immunocompetence pre-transplant status evaluation revealed IgG hypogammaglobulinemia, seronegative cytomegalovirus IgG serology (donor cytomegalovirus IgG serology was positive), low anti-pneumococcal antibody titer, and low CD4 and CD8 T-cell counts (Table 1). Pre-transplant immunological evaluation was performed after biventricular assist device placement. A severe combined secondary immunodeficiency was disclosed very early between day 7 and 30 after transplantation, composed of severe IgG hypogammaglobulinemia (IgG < 400 mg/dL), low specific anti-pneumococcal antibodies (< 5 mg/dL), C3 hypocomplementemia (< 80 mg/dL), low CD4 (< 200 cells/uL), low CD8 (<100 cells/uL), low NK cell counts (<30 cells/uL) and low CD8+ interferon gamma producing cells against IE-1 CMV antigen. At day 43 after transplantation, ISHLT grade 3A acute cellular rejection complicated the clinical history and therapy with methylprednisolone plus one dose of anti-CD25 monoclonal antibodies due to severe ventricular dysfunction (Daclizumab 75 mg) were added. Table 1 Immunological characteristics of the patient. Pre-HT: Beforte heart transplantation. INF-gamma: interferon gamma. NK: natural killer. C3: complement C3. C4: complement C4. Anti-PPS: anti-pneumococcal polysaccharide antibodies. Anti-HBs: anti hepatitis B surface antigen. CRP: C-reactive protein. During the first 3 months after transplantation, several infectious complications appeared including; the development of mechanical ventilation associated pneumonia (acinetobacter baumannii + pseudomona aeruginosa at 35 days), invasive aspergillosis in the surgical wound with mediastinitis, pulmonary compromise treated with voriconazole (at day 41), and CMV infection (defined as CMV viremia > 10000 copies/mL) treated with gancyclovir (at day 55). Voriconazole was maintained for 8 months. Other bacterial, viral and parasitic infections were documented. The recipient accumulated a total of 21 positive cultures during the first 6 months after transplantation (Table 2). Other complications included compartment syndrome needing a fasciectomy and gastrointestinal bleeding. Time of hospitalization between the transplantation procedure and discharge was 69 days. Table 2 Infections demonstrated in distinct episodes after transplantation. Due to the secondary immunodeficiency that included severe IgG hypogammaglobulinemia, low specific anti-pneumococcal antibodies and low specific anti-cytomegalovirus antibodies, IVIG replacement therapy was started very early at day 7 after transplantation. A 5% IVIG preparation was used at a dose of 400 mg/kg/month. IVIG infusions were maintained up to 9 months after transplantation. Reconstitution of IgG (> 750 mg/dL) and of distinct specific antibodies was demonstrated (Table 1). Taking into account the absence of new infections between 6 and 9 months and normalization of IgG levels, IVIG infusions were then stopped at 9 months. A progressive decrease of IgG levels was later observed after IVIG infusions were stopped. The patient was re-admitted 20 months after transplantation with dyspnea. A thoracic CT-scan disclosed multiple lung embolisms and a mass in the retroxiphoid invading the right atrium and the tricuspid valve. Partial resection of the mass was conducted. Septated hyphae invading this tissue were observed and aspergillus fumigatus was isolated. Serum galactomannan determinations were negative. A reduction in the dose of mycophenolate and tacrolimus was performed. Anti-fungal therapy with voriconazole was started at a dose of 400 mg BID for 21 days; then 200 mg BID as long-term maintenance therapy (trough levels were maintained between 3.5–5 μg/mL during hospitalization). Caspofungin was also used during the first 21 days of anti-fungal therapy. Due to IgG hypogammaglobulinemia at the time of re-admission, IVIG was re-started. Due to the severity of the infectious complication, the new aim of IVIG therapy was to reach IgG levels around 1000 mg/dL. During follow-up after IVIG therapy was re-started, a 7-fold increase of IgG anti-aspergillus fumigatus antibodies was demonstrated (16 to 113 mg/L). The patient maintained periodic immunological controls and was in good clinical condition. IVIG infusions were not stopped again. Despite the severity of the infectious complication, a survival of more than 2 years was obtained. Voriconazole-induced QT interval prolongation was not observed. The patient finally died due to a sudden death. There was no post-mortem evaluation. Severe infectious complications were observed in a patient who was found to develop a severe combined secondary immunodeficiency after heart transplantation. 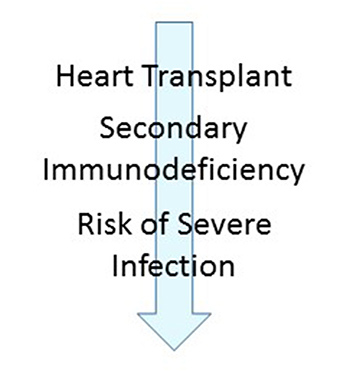 The use of a ventricular assist device, the transplantation procedure itself (open heart surgery, technique of extracorporeal circulation), induction and triple maintenance immunosuppressive therapy and treatment of acute cellular rejection were additional risk factors in this case for the development of the secondary immunodeficiency during the first weeks after heart transplantation. We have previously reported an early immunological score that is associated with a higher risk for development of severe infections . This patient was found to have all the components of this score at day 7, namely IgG < 600 mg/dL, C3 < 80 mg/dL, C4 < 20 mg/dL, CD4 < 350 cells/uL and NK cell counts < 30 cells/uL . Host recognition of fungal cell wall components is critical for fungal uptake, killing, and the formation of protective innate and T-cell effector populations. Beyond the known role of neutrophils and macrophages, circulating monocytes, dendritic cells, and natural killer cells contribute to optimal defense against aspergillus fumigatus. For a long time it was considered that the cell-mediated immunity (CMI, CD4+ and CD8+ T-cell responses) was relevant, but humoral immunity had a minor or no role in the control of fungal infections. However, it is accepted now that CMI is the main mechanism of control, but that an specific antibody response is also protective. Soluble mediators of the innate and acquired immunity that involve the complement system, anti-microbial peptides, cytokines and antibodies are considered to play a complementary role in the defense of fungal pathogens. These mediators are essential in achieving an efficient clearance of the fungal antigens [6,7]. Low CD8 T-cell counts have been described as a predictor of risk and mortality in critically ill immunocompromised patients with invasive pulmonary aspergillosis . In the presented case, low CD8 T-cell count were disclosed before and after heart transplantation. Since it is unlikely that a single abnormality explain the risk for development of severe infections, the combined secondary immunodeficiency status of this patient was probably associated with the severity of the infectious complications that she developed after transplantation. The presence of intracardiac aspergillosis is a very unusual severe infectious complication after heart transplantation [9,10]. The combination of this complication with severe secondary antibody deficiency is a challenge. After assessing the clinical complication, advisability of surgical correction was not considered in this case. A prolonged therapy with IVIG combined with anti-fungal therapy was associated with an unexpected prolonged survival after intracardiac lesions were demonstrated. Interestingly enough, maintenance of normal IgG levels were dependent in this case on the prolonged administration of IVIG. During the time of intracardiac aspergillus complication, IgG levels were low but CD4+ and CD8+ T-cell counts were within normal ranges which might highlight the potential role of humoral immunity for the control of the fungal infection. We have previously reported that addition of IVIG replacement therapy in heart recipients with severe IgG hypogammaglobulinemia and refractory CMV disease despite gancyclovir therapy was associated with clearance of CMV viral load and remission of CMV-related symptoms . In another report we suggested the role of IgG replacement in the control of systemic aspergillus infection in a patient with secondary antibody deficiency after heart transplantation . We have also reported that IgG replacement therapy is associated with reconstitution of specific antibodies in heart recipients with severe infections and IgG hypogammaglobulinemia . In the present case, an increase of titers of IgG anti-aspergillus fumigatus antibodies was observed after IVIG infusions were added. In conclusion, long term survival was observed in a patient with severe invasive aspergillosis affecting the mediastinum that progressed into the heart tissues. The observed outcome, despite the severity of the infectious complication, suggest that IVIG in combination with anti-fungal therapy might have a role to long-term control of this infectious complication in a patient with severe secondary antibody deficiency. However, it is possible that long-term anti-fungal therapy alone was effective in maintaining this patient's survival. The potential role of IVIG for the therapy of solid organ recipients with severe IgG hypogammaglobulinemia and invasive fungal infections after transplantation warrants evaluation in future randomized clinical trials. Javier Carbone: Acquisition of immunological data. Designing and drafting the work; Juan Fernandez-Yañez: Acquisition of clinical data; Iago Sousa: Acquisition of clinical data; Patricia Muñoz: Acquisition of clinical and microbiological data; Elizabeth Sarmiento: Acquisition of immunological data. Drafting the work; All authors: Final approval of the version to be published. Hearn VM, Pinel C, Blachier S, Ambroise-Thomas P, Grillot R. Specific antibody detection in invasive aspergillosis by analytical isoelectrofocusing and immunoblotting methods. J Clin Microbiol. 1995; 33: 982-986.